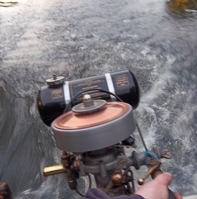 Have you ever seen a bronze conrod mounted on a SD outboard? Is that a seagull conrod? Does it have seagull stamped or cast on it? It could possibly be a conrod from a villiers engine or something like that? I don't know if it is a seagull conrod. I've never seen one brass made. It has no stamps. I've never seen a war time or a post war Seagull with a bronze conrod, though the majority of pre-war Marstons had bronze rods, to say if was one of those I would need the little end & big end diameters & the exact center to center distance in mm.